A couple of years back, lured by the prospect of not needing to mix up kalkwasser on a nightly basis, I purchased a used calcium reactor from someone getting out of the hobby. It was a Knop unit with a regulator, needle valve and solenoid. Coupled with a 15 lb. CO2 cylinder and a peristaltic pump, I was pretty sure the Knop unit would handle the calcium load in my 75 gallon hard coral tank, and the CO2 cylinder should only need to be filled every 6-12 months. It took me a while to get around to actually setting it up, but I figured I was in for a treat. I was wrong. I finally understood the frustration that drives people to leave this obsession… err, hobby. It was nearly impossible to get the CO2 flow rate stable for more than a day. I think I got lucky with my first CO2 cylinder. Although the needle valve was difficult to adjust, I got it set to 20-30 bubbles/minute and it stayed there. My initial cylinder lasted about two months; then seemed to go from full to empty in one day. After getting the cylinder re-filled, I had a much harder time with the adjustment. Although I hadn’t touched the needle valve since the first time, it suddenly turned ‘digital’. It either seemed to be off or “full stream” on, with no middle point of adjustment. I consulted a few reefkeepers and asked for help. One offered the following advice: Turn the screw to adjust the pressure on the low pressure gauge from 10 lbs. to something in the 1-2 lbs range. That helped. The needle valve seemed to gain some sensitivity, and now had a point where a quarter turn could change the flow from off to full bore. I set the flow, checked it several times over the course of the next few hours. Satisfied it was ok I left it alone. Next morning, of course, it was streaming. Major readjustment…got the flow right again. I blew through that 15 lb. cylinder in about two-three weeks. The next cylinder was worse. Set the flow at 20 ‘bubbles’ per minute, checked it every hour for the next six hours (6 PM to midnight), got up the next morning at 6 am only to discover that the cylinder was completely empty. The needle valve had vented the entire tank – 15 pounds of CO2 – in six hours. At this point, I was ready to toss the regulator and buy a new one. Based on Brian’s recommendation, I called Dwyer the next week, ordered the recommended RMA-151-SSV part and waited. It arrived later the same week. Not bad, but Chicago is close to Michigan City, Indiana. So what is the difference between a needle valve and a flow meter? In many aspects not much. Both have needle valves. The visible difference is that the flow meter has a gauge for measuring flow of gas through the meter. I removed the Norgren needle valve and installed the Dwyer replacement. It was relatively simple to replace, although I needed to bring the unit into Home Depot in order to purchase a small connector and some Teflon pipe thread tape. The difference in feel was immediately evident. Dwyer’s needle valve was much easier to adjust, and had a nice ‘feel’ to it. I was able to set the flow to the bubble counter within a minute to 20-30 bubbles/minute. Minor adjustments to the needle valve now reflected in small adjustments in the bubble count as well. Once set, I waited for the flow rate to change, but it remained steady. I remember thinking, “This is too easy.” Over the next few months, I’ve learned that you can pretty much set and forget it. I’ve had to touch it only when I’ve wanted to adjust the flow rates slightly. There is one down side to the unit: I’ve discovered that the gauge isn’t all that useful for me. The unit measures from 0-50 cc/min (with 5cc gradations) and I am probably feeding my calcium reactor something on the order of 2-4 cc/min. I wish Dwyer made a unit with a range of 0-10 cc/min or 0-20 cc/min instead. The meter would be much easier to read and consequently far more useful. Possibly others feeding more CO2 into their reactors will not find this a limitation. All in all, I’ve found this to be one of the better investments I’ve made on my reef tank. 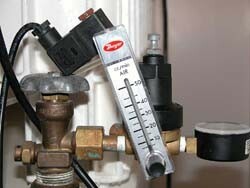 The needle valve on the Dwyer unit is much easier to adjust mainly due to the fact that the needle has a larger range. While turning the Norgren valve 10 or 20 degrees would take you from full stop to full stream, the RMA-151-SSV’s flow rate is proportional to the amount turned. You can easily dial it in, set it and be certain that the amount won’t drastically change afterwards. After losing $30 of CO2 in less than a month, I can say that the Dwyer unit has paid for itself since then. Conclusion: For anyone who is having any problems with their needle valves, trying to adjust the flow of CO2 into their reactors, I wouldn’t hesitate to recommend this Dwyer unit as a replacement. It is easy to set and stays set. Can I interest anyone in a lightly used Norgren needle valve?